As well as launching the Coolpix A1000 earlier today, Nikon has also unveiled the B600 – a new addition to its range of bridge cameras. 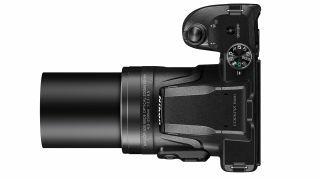 The 16-megapixel B600 offers a big 60x optical zoom lens, with an effective focal length of 24–1440mm. That's enough telephoto power for serious close-ups of the blood moon this weekend for instance - or for shots of distant birds. As is the style with bridge cameras, there is a chunky grip to keep things steady – but at the far end of the zoom range you will need some extra support from a tripod, say. The camera offers Full HD video recording via a dedicated movie button, but does not offer 4K video, and is limited to 30fps. There is 3 inch, 921k-dot LCD monitor with adjustable brightness and an anti-reflective coating. There is Snapbridge support, allowing you to connect the camera to your Android or Apple phone or tablet using the free Nikon app. The Coolpix B600 slots in between the B500 and B700 in the budget Nikon bridge camera range. It offers a wider zoom range than the B500, but has fewer megapixels than the B700. There is also a premium range of Nikon bridge cameras – currently comprising of the P900 and P1000. The Coolpix B600 is to go on sale in February with a recommended price of £329 / $329.